I think we can all agree that last season, the Los Angeles Angels Mike Trout put on quite a show. 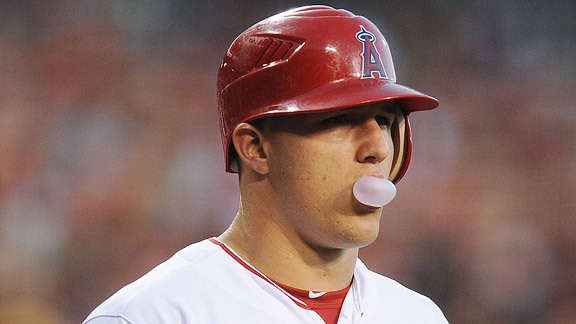 But disagree if you must, the Angels did nothing wrong giving Trout that second-year salary. I know the numbers (30 home runs, 83 RBI’s, 49 steals, 129 runs, and a slash line that read .326/.399/.564), and we all know the accolades (second in MVP voting, 2012 Rookie of the Year, first time All-Star), but something that should be remembered as Trout’s agent raises a fuss about his $510,000 salary for 2013 ($20,000 raise from 2012). He’s a second year player, with much still to prove. Yes, he got the lowest percentage raise (4%) of any ROY winner in the last decade. I understand that his season was one for the history books to scream to the baseball Gods about. But I say again, he’s entering into year two of his career; and after showing up an extra 10 to 15 pounds heavier to camp this year, I don’t know if you want to start the negotiations there or not. I say that as a Trout supporter just poking fun. If you remember, I was the guy who almost ranked him ahead of Bryce Harper last season among rookie arrivals (didn’t see 30-homer potential). But what most have to understand is that the Angels aren’t doing Trout a disservice by being fiscally smart when it comes to their overall team. Looking at it from a business standpoint, it makes perfect sense not to heap money on the guy yet; and when you consider his age and the fact that he’s not a free agent until 2018, if he continues at his current pace he will get paid. Jery Dipoto: “Alright, league minimum is this, we’re paying you “x” amount of dollars past that. Go get’em champ! A majority of the reason I agree with the Angels is because of the economic impact it has on the league as a whole. What happens if a “Rose rule” (as my “Locker Talk” co-host Baden Bagley and I discussed earlier in a conversation) were available as there is in the NBA? What, then, would become the criteria for it and how do we accurately determine it? Would the Rookie of the Year award be an automatic trigger for a multi-million dollar windfall, year two? How would teams in Tampa Bay, Baltimore, Pittsburgh, Milwaukee, Kansas City, Denver, etc. sustain a financial situation of teams giving payouts that large to players that early? They wouldn’t be able to afford them by the time they reached arbitration. I don’t see a disrespect to Mike Trout. I see a second-year player going through the financial system of his sport accordingly. He will have plenty of time to get paid. And trust me, he will get paid.